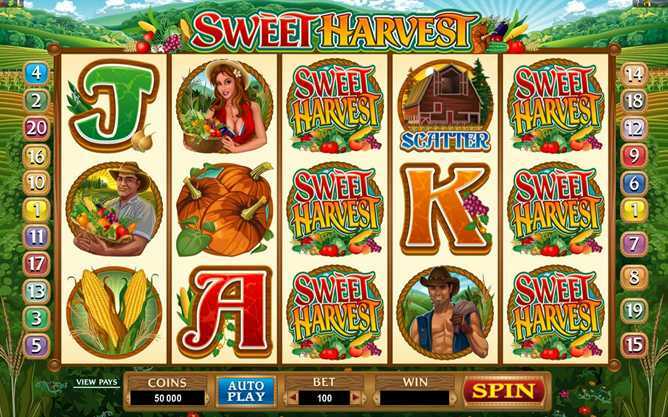 Casino LaVida :: Sweet Harvest video slot - PLAY NOW! The clean air and an absence of emergency vehicle sirens are always good reasons to escape to the countryside, but this week Casino LaVida is offering players an equally compelling invitation to do some bucolic betting on the latest 5 Reel, 20 Payline Video Slot to hit the internet, SWEET HARVEST. Be on the alert, too for the large basket of succulent fruit which heralds the Sweet Harvest bonus on reels 2 or 4, when it rewards the player with a random prize. Players will find that this brand new slot caters for almost every bankroll, with a betting range that runs from as little as 0.01 up to 0.25 a line, and a maximum bet of 25.00. That could bring the skilled and fortunate punter a maximum reward of 50 000.00 in the Base Game and twice that on Free Spins. Everyone needs a break now and again, and Sweet Harvest provides the sort of rural R&R entertainment and relaxation that’s just the ticket – try it today at Casino LaVida.